Study of the 1969 uprising in the Argentine city of Cordoba, known as the Cordobazo, which saw students and workers rise up against the military dictatorship of General Juan Carlos Onganía with a series of strikes and urban riots. In 1955, a coup d’etat overthrew Juan Domingo Peron’s government, thereby beginning a period of a circumscribed democratic rule and successively weak military and civilian governments. The proscription of the country's principal political force, Peronism, deprived all the governments of the period of the legitimacy they needed to withstand the opposition and intrigues of other political actors in Argentine society and remain in power. The outlaw status of the Peronist party, in turn, forced its followers to work through non-parliamentary means and to establish practices, especially within the ranks of the Peronist working class, which justiﬁed direct action and labor militancy. Society was increasingly divided in its outlook and political practices between the pueblo-antipueblo and peronista-antiperonista, a polarization which undermined political dialogue and compromise through normal constitutional means. By late afternoon, the protest had turned destructive. On Avenida Colon, the city’s principal commercial street, protesters burned down the ofﬁces of Xerox, a Citroen dealership, and many other businesses. On the nearby La Canada street, they sacked the junior ofﬁcers’ club. The targets and nature of the destruction were signiﬁcant. Whereas during the October 17-18, 1945 protests, the working class in various Argentine cities had vented its collective fury over Peron’s imprisonment against the ]Jockey Club, the university, and other symbols of aristocratic privilege, in May, 1969 the Cordoban worker and student protesters targeted the representatives of the govemment and its perceived ally, foreign imperialism.36 Moreover, the destruction was not wanton. The Cordobazo was remarkably free of incidents of pillaging or looting. The protesters destroyed but did not ransack. Nor were there many examples of gratuitous violence and none of the sanguinary terror such as surrounded the events of Latin America’s other great urban protest in this century, the Bogotazo. On the city’s western outskirts, General Sanchez Lahoz, on the orders of Ongania and army commander General Alejandro Lanusse, declared a curfew and prepared troops from the Cordoban-based Third Army Corps for a march on the city. Around ﬁve o’clock, they began to enter the city’s western districts and by six they had moved into the barricaded zone and received the ﬁrst gunﬁre. The appearance of the rooftop snipers added the third element to the Cordobazo, that of an urban insurrection led by more organized groups with clearer political, perhaps even revolutionary designs. The appearance of these groups, not included in the original planning of the protest, remains the most controversial aspect of the uprising. The regime would later attempt to attribute the Cordobazo solely to them, to a carefully organized plot by the revolutionary left with support from the international communist movement. Such a scenario naturally ﬁt the purposes of the regime and served to deflect the causes of the protest from popular discontent to sinister revolutionary cabals. The insurrectional component was, in terms of the number of participants and the underlying causes of the uprising, a relatively minor facet of the Cordobazo when compared to either the worker-student protest or the popular revolt of the Cordoban citizenry. Nevertheless, it cannot be simply written off as the ranting of a mortally wounded dictatorship; its presence merits some explanation. The Cordobazo had its roots in the particular characteristics and distinct political culture of Cordoba which interacted with a speciﬁc historical conjuncture to produce a protest of unforeseen violence and consequences never imagined, notably by its own protagonists. The Ongania regime galvanized the opposition of diverse groups and classes in the city, each with its own set of grievances, who found common cause in the local working class’s protest. The workers provided the largest contingent of protesters for the length of the uprising, but nearly all the Cordoban citizenry was represented in the rebellion. The Cordobazo was also a spontaneous revolt. Other than the loose plan that union and student leaders had worked out for the May 29th demonstrations, there was no organized strategy, much less any presentiment of the shape that events that would take. The Cordobazo certainly cannot be attributed to revolutionary designs, either on the part of Cordoban auto workers or the city’s other unions. Similarly, economic causes were just one of a number of factors contributing to the opposition to the regime. Finally, because of the close association between the government's economic program and its authoritarian character, the protest was felt and expressed more as a direct political opposition, a protest against non-democratic rule, than an ideological one. 1. Juan Carlos Agulla, Diagnostico social de una crisis: Cordoba, mayo de 1969 (Cordoba: Editel 1969); “Signiﬁcado de Cordoba,” Aportes 15 (Jan. 1970): 48-61; Francisco Delich, Crisis y protesta social: mayo de 1969 (Buenos Aires, 1970), “Córdoba: la movilización permanente,” Los libros 3: 21 (Aug. 1971): 4-8; Ernesto Laclau, “Argentina-Imperialist Strategy and the May Crisis,” New Left Review 62 (July-Aug. 1970): 3-21; Robert Massari, “Le cordobazo,” Sociologie du Travail 4 (1975): 403-418; James Petras, “Córdoba y la revolución socialista en la Argentina,” Los libros 3: 21 (Aug. 1971): 28-31. 2. Henry J. Landsberger, “The Labor Elite: Is it Revolutionary ?”, Elites in Latin America, S. M. Lipset and Aldo Salari, eds. (Oxford, 1967), pp. 256-300, is representative of the pre-Cordobazo consensus. 3. Juan Carlos Agulla, Diagnostico social de una crisis: Córdoba, mayo de 1969, (Córdoba, 1969), pp. 23, 81. This particular interpretation continues to be a favorite of non-leftist scholars of the Argentine working class. See Peter Ranis, Argentine Workers. Peronism and Contemporary Class Consciousness (Pittsburgh and London, 1992), pp. 186-187. 4. Echoes of this argument can also be heard in subsequent sociological interpretations, especially by a somewhat dogmatic school of Argentine Marxists, who attribute the Cordobazo solely to working-class economic grievances. See B. Balvé and B. Balvé, El ’69. Huelga política de masas (Buenos Aires, 1989), pp. 195-199. Both the Marxist (which, in reality, is simply a vulgar Marxist analysis) and labor aristocracy arguments suffer from the same ascriptive ﬂaw in interpretation. Both assume that a particular kind of economic development and the existence of a speciﬁc “worker’s condition” resulting from employment in a determined economic sector (e.g. an automotive multinational) can explain the working class’s political comportment, in this case its participation in a major urban protest. They minimize the special political circumstances which triggered a by no means, as such interpretations often seem to imply, inevitable protest. They also overlook or minimize the other factors that this article will address: the development of a local militant trade union tradition, the formation of a uniquely Cordoban “conciencia sindical” in the city’s principal unions which heightened the identiﬁcation between the workers and the union, and especially the important role played by other sectors of Cordoban society, including other sectors of the working class, in the uprising. 5. See Oscar Anzorena, Tiempo de violencia y utopía (1966-1976) (Buenos Aires, 1988); Guillermo O’Donnell, Modernization and Bureaucratic Authoritarianism (Berkeley, 1979); Gregorio Selser, El onganiato, vols. I, II (Buenos Aires, 1986). 6. Informe, Servicio de Documentacion e Informacion Laboral, 85 (March, 1967): 12-23. 7. Archives des Usines Renault, Boulogne-Billancourt. Direction juridique 0734 3400 “Argentine” File “Situation IKA,” Memorandum from]. M. Palacios to M. Maison, Jan. 16, 1967; Memorandum from A. Copain Mefray to M. Maison, Feb. 3, 1967. 8. Informe, Servicio de Documentacion e Informacion Laboral 89 (July 1967): 6; Electrum IV, 109 (March, 1967): 1-4. 9. Monica B. Gordillo, “Los prolegomenos del Cordobazo: los sindicatos líderes de Córdoba dentro de la estructura de poder sindical,” Desarrollo Economico 31:122 (July-Sept. 1991): 171-172. 10. La Voz del SMATA, SMATA-Cordoba IV: 32 (Nov. 1968): 6. 11. Carlos E. Sanchez, Estrategias y objetivos de los sindicatos argentinos (Córdoba, 1973), p. 34; I. M. Roldan, Sindicatos y protesta social en la Argentina. Un estudio de caso: el Sindicato de Luz y Fuerza de Córdoba (1969-1974) (Amsterdam, 1978), pp. 119-120. 12. Sindicato de Luz y Fuerza de Córdoba, Memoria y Balance (1966-67). pp. 69-71, “La situacion económica-ﬁnanciera de la Empresa Provincial de Energia de Cordoba. Una contribución sindical a su solución,” Electrum XVI: no. 65 (Aug. 1972): 6-11. 13. The SMATA’s union publications, comuniqués, and broadsides throughout the 1960s are replete with a syndicalist language which presents the union as the main repository of Peronist traditions regarding the protection and advance of basic workplace rights. This linea dura discourse contains strong anti-capitalist currents that have clear roots to the Resistance. See, for example, La Voz del SMATA 1:3 (June 1964): 1-3 and El mecanico 6:5 (Nov. 1967): 3. On the resilience of the Resistance’s myths and political consciousness in the Argentine working class generally, see Daniel ]ames, Resistance and Integration. Peronism and the Argentine Working Class, 1946-1976 (Cambridge, 1988). 14. James P. Brennan, “El clasismo y los obreros. 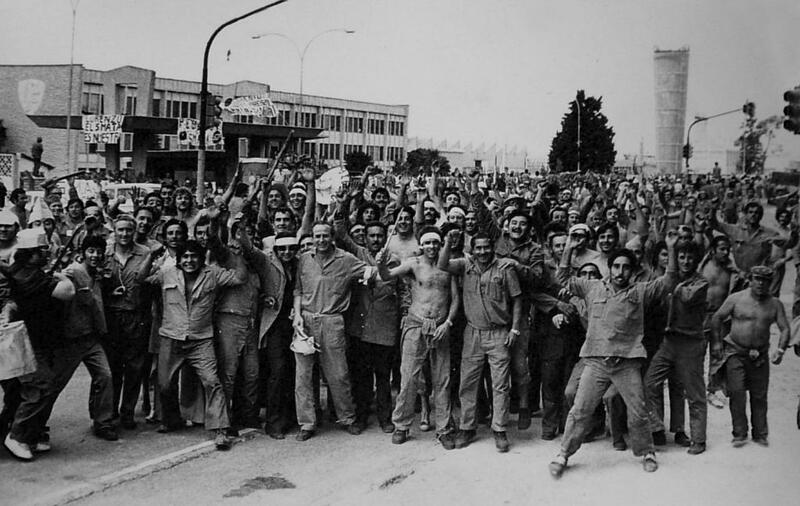 El contexto fabril del sindicalismo de liberación en la industria automotriz cordobesa, 1970-1975,” Desarrollo Economico 32: 125 (April-lune 1992): 9-12. 15. Gordillo, “Los prolegómenos del Cordobazo: los sindicatos líderes de Córdoba dentro de la estructura de poder sindical,” pp. 181-182. 16. Clarin, May 12, 1969, p. 24, “El sindicalismo cordobés en la escalada,” Aqua’ y ahora 3:26 (May 1971): 6-15. 17. La Voz del Interior, May 7, 1969, p. 21. 19. “El sindicalismo cordobés en la escalada,” Aquí y ahora, pp. 6-15. 20. Gordillo, pp. 184-185; Roldan, Sindicatos y protesta social en la Argentina, pp. 133-145. 21. Ramon Cuevas and Osvaldo Reicz, “El movimiento estudiantil: de la Reforma al Cordobazo,” Los libros 21 (Aug. 1971): 17-18. 22. Claudia Hilb and Daniel Lutzky, La nueva izquierda argentina: 1960-1980 (Buenos Aires, 1984), p. 20; Richard Gillespie, Soldiers of Peron. Argentina’s Montoneros (Oxford, 1982), pp. 52-60. 23. Cuevas and Reicz, “El movimiento estudiantil: de la Reforma al Cordobazo,” pp. 17-18. 24. CGT 1:1 (May 1968): 1; COT 1:2 (May 1968): 1; CGT 1:10 (July 1968): 2. 25. “Declaración de Córdoba,” Regional Delegation, March 21, 1969. 26. La Voz del Interior (Córdoba), March 23, 1969, p. 34; La Voz del Interior (Córdoba), May 6, 1969, p. 11; La Voz del Interior (Córdoba), May 21, 1969, p. 10; Agustín Tosco, “Testimonio del cordobazo," Presente en la lucha de la clase obrera. Selección de trabajos (Buenos Aires, 1984), pp. 37-55. 28. The importance of the repeal of the “sabado inglés” as a causal explanation for the Cordobazo, nonetheless, has been greatly overstated and is the common property of both the labor aristocracy and vanguard interpretations of the working class’s role in the uprising with which we disagree. The government’s revocation of the “sabado inglés” applied only to workers who entered employment in the companies after the abrogation of the law. For all the workers who were already on the payroll, in IKA-Renault and in other provincial industries where it was paid, it remained in effect. The importance of the “sabado inglés” repeal on the Cordobazo was thus less direct than is generally assumed. Rather, its signiﬁcance was as yet another event which raised tensions in the city at a critical moment and deepened the unrest in working-class ranks with a govemment widely perceived to be hostile to its interests. 29. Jeronimo 1, 10 (May 20, 1969). 30. Daniel Villar, El cordobazo (Buenos Aires, 1971), p. 12; lorge Bergstein, El cordobazo. Testimonios, memorias, reﬂexiones (Buenos Aires, 1987), pp. 58-59. 31. Interviews, Elpidio Torres, secretary general of Cordoban SMATA, Córdoba, July 25, 1985; Miguel Correa, secretary general of the CGT de los Argentinos, Córdoba delegation, July 3, 1985; Alfredo Martini, vice-president of Cordoban UOM, Cordoba, July 20, 1987. 33. Narrative histories of the Cordobazo, of varying degrees of accuracy, can be found in Roqué Alarcón, Cordobazo ( Buenos Aires, 1989); B. Balvé and B. Balvé, El ’69. Rosariazo-Cordobazo-Rosariazo (Buenos Aires, 1989); Jorge Bergstein, El cordobazo (Buenos Aires, 1987); M. Bravo Tedin and G. Sarria, El cordobazo, un grito de la libertad (La Rioja, 1989); Daniel Villar, El cordobazo (Buenos Aires, 1971). Our reconstruction and analysis of the Cordobazo is based primarily on the oral testimony of worker, student, and middle-class participants in the uprising, the only historical record that remains, outside of newspaper accounts, of the protest. 34. Interview, Fernando Solis, administrative employee in the IKA-Renault forge plant, Cordoba, August 10, 1989. 35. Interview, Luis Rubio, university engineering student, Cordoba, May 22, 1990. 36. Nor, given the strength of the worker-student alliance in these months in Cordoba and elsewhere in the country, of course, were there examples during the Cordobazo of working-class resentments directed against the students such as those found in the October 17-18, 1945 events. The insults and taunts such as “¡alpargatas si, libros no!” hurled against the students and the general anti-elitist, anti-intellectual tenor of the working-class protest that characterized the October 17-18 events had no counterpart in the Cordobazo. See Daniel James, “October 17th and 18th: Mass Protest, Peronism and the Argentine Working Class,” Journal of Social History (Spring, 1988): 445, 452-454. 37. Interview, Alberto, university student, Cordoba, September 22, 1989. 38. Interview, Alejo Simo, president of Cordoban UOM, Córdoba, June 30, 1985; Alfredo Martini, vice president of Cordoban UOM, Cordoba, July 20, 1987. 39. Interview, Elpidio Torres, president of SMATA-Cordoba, Córdoba, July 25, 1985. 40. Interview, Jorge Sanabria, university student, Cordoba, August 12, 1989. 41. Agustin Tosco, taped testimony of the events of the Cordobazo, circa 1972, Luz y Fuerza headquarters, Cordoba. 42. Agustin Tosco, taped testimony of the events of the Cordobazo, circa 1972, Luz y Fuerza headquarters, Cordoba. Tosco’s testimony is adamant on this point and is conﬁrmed by the oral testimony of Radical and Peronist militants. 43. Interview, Osvaldo, university engineering student performing his military service at the time of the Cordobazo, Cordoba, August 10, 1989. 44. Agustin Tosco, taped testimony of the events of the Cordobazo, Luz y Fuerza headquarters, Córdoba. Interview, Felipe Alberti, member of Luz y Fuerza executive committee, Cordoba, July 22, 1985. Interview, Oscar Alvarez, member of Luz y Fuerza executive committee, Cordoba, August 5, 1987. 45. Daniel Villar, El cordobazo (Buenos Aires), p. 96; La Voz del Interior (Córdoba), May 31, 1969, p. 13; La Voz del Interior (Córdoba), June 1, 1969, p. 16. 46. The authors’ interpretations of the Cordobazo generally coincide, enough obviously, that they feel comfortable co-authoring an article on the uprising. This is perhaps the most important point where they diverge. Brennan puts much more emphasis on the peculiarities of Cordoban society combined with the speciﬁc conjuncture of the Ongania dictatorship as the explanation for the May events. Gordillo asserts that,‘in addition to these factors, that there was gestating throughout the 1960s in the city a “culture of resistance” and that certain political “imaginaries,” among them the proto-revolutionary sentiments of the students for example, were also present in the protest. 47. Interview, Alberto, university student, Cordoba, September 22, 1989. Brennan also believes such sentiments were present in the Cordobazo, but argues that their inﬂuence in the 1969 protest should not be overstated, that to do so conﬂates the ideology of the 1970’s with that of the 1960’s and ignores the importance of the liberal political culture of the majority of Cordoba’s university students in 1969. 48. Interview, Mizael Bizzotto, IKA-Renault shop steward, Cordoba, August 15, 1989. 49. Interview, Miguel A. Contreras, President of Cordoban Communist Party, Cordoba, November 23, 1989. 50. Interview, Nora, university student, Cordoba, July 22, 1989. 51. Interview, Fernando Solis, administrative employee IKA-Renault forge plant, Cordoba, August 10, 1989. 52. Interview, Rodolfo, parish priest and member of “Sacerdotes del Tercer Mundo” movement in Cordoba, Cordoba, September 1, 1989. The Cordobazo was, as this testimony indicates, a protest which drew in almost the entire Cordoban working class, not just the presumed labor elite in the local automobile industry. Indeed, one of the few sectors of the working class which did not participate notably in the protest were the Fiat workers, in 1969 still closely watched through their company-controlled plant unions, SITRAC-SITRAM, and therefore not included by the other unions in the planning of the May 29 general strike. Only a handful of Fiat workers marched into the city center to participate in the protest. 53. Interview, Luis, university student, Cordoba, March 3, 1990. 54. Brennan, “El clasismo y los obreros. El contexto fabril del sindicalismo de liberación en la industria automotriz cordobesa,” pp. 15-19.